Not to be confused with tuff, a porous volcanic rock also called 'tufa'. For other uses, see Tufa (disambiguation). Tufa is a variety of limestone formed when carbonate minerals precipitate out of ambient temperature water. Geothermally heated hot springs sometimes produce similar (but less porous) carbonate deposits known as travertine. Tufa is sometimes referred to as (meteogene) travertine. It should not be confused with hot spring (thermogene) travertine. Tufa, which is calcareous, should not be confused with tuff, a porous volcanic rock with a similar etymology that is sometimes also called "tufa". Modern and fossil tufa deposits abound with wetland plants; as such many tufa deposits are characterised by their large macrobiological component and are highly porous. Tufa forms either in fluvial channels or in lacustrine settings. Ford and Pedley (1996) provide a review of tufa systems worldwide. 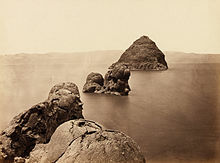 Barrage – Deposits form as a series of phytoherm barrages across a channel, which may grow up to several metres in height. Barrages often contain a significant detrital component, composed of organic material (leaf litter, branches etc.). Lacustrine tufas are generally formed at the periphery of lakes and build up phytoherms (freshwater reefs) and stromatolites. Oncoids are also common in these environments. While fluvial and lacustrine systems make up the bulk of tufa systems worldwide, there are several other important tufa environments. Although sometimes regarded as a distinct carbonate deposit, calcareous sinter formed from ambient temperature water can be considered a sub-type of tufa. Calcareous speleothems may be regarded as a form of calcareous sinter. They lack any significant macrophyte component due to the absence of light, and for this reason they are often morphologically closer to travertine or calcareous sinter. 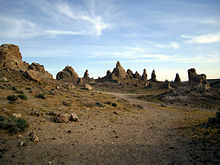 Tufa columns are an unusual form of tufa typically associated with saline lakes. They are distinct from most tufa deposits in that they lack any significant macrophyte component; this is due to the salinity excluding mesophilic organisms. Some tufa columns may actually form from hot-springs and therefore actually be a form of travertine. It is generally thought that such features form from CaCO3 precipitated when carbonate rich source waters emerge into alkaline soda lakes. They have also been found in marine settings in the Ikka fjord of Greenland where the Ikaite columns can reach up to 18 m (59 ft) in height. Tufa deposits form an important habitat for a diverse flora. Bryophytes (mosses, liverworts etc.) and diatoms are well represented. The porosity of the deposits creates a wet habitat ideal for these plants. Modern tufa is formed from alkaline waters, supersaturated with calcite. On emergence, waters degas CO2 due to the lower atmospheric pCO2 (see partial pressure), resulting in an increase in pH. Since carbonate solubility decreases with increased pH, precipitation is induced. Supersaturation may be enhanced by factors leading to a reduction in pCO2, for example increased air-water interactions at waterfalls may be important, as may photosynthesis. Recently it has been demonstrated that microbially induced precipitation may be more important than physico-chemical precipitation. Pedley et al. (2009) showed with flume experiments that precipitation does not occur unless a biofilm is present, despite supersaturation. Calcite is the dominant mineral precipitate found; however, the polymorph aragonite is also found. Tufa is today occasionally shaped into a planter. Its porous consistency makes tufa ideal for alpine gardens. A concrete mixture called hypertufa is used for similar purposes. ^ Pentecost, A. (2005). Travertine. Dordrecht, Netherlands: Kluwer Academic Publishers Group. ISBN 1-4020-3523-3. ^ Koban, C.G. ; Schweigert, G. (1993). "Microbial origin of travertine fabrics - two examples from Southern Germany (Pleistocene Stuttgart travertines and Miocene riedöschingen Travertine)". Facies. 29: 251–263. doi:10.1007/BF02536931. ^ a b Ford, T.D. ; Pedley, H.M. (1996). "A review of tufa and travertine deposits of the world". Earth-Science Reviews. 41 (3–4): 117–175. Bibcode:1996ESRv...41..117F. doi:10.1016/S0012-8252(96)00030-X. ^ Pedley, H.M. (1990). "Classification and environmental models of cool freshwater tufas". Sedimentary Geology. 68: 143–154. Bibcode:1990SedG...68..143P. doi:10.1016/0037-0738(90)90124-C.
^ Buchardt, B.; Israelson, C.; Seaman, P.; Stockmann, G. (2001). "Ikaite tufa towers in ikka fjord, southwest Greenland: their formation by mixing of seawater and alkaline spring water". Journal of Sedimentary Research. 71 (1): 176–189. Bibcode:2001JSedR..71..176B. doi:10.1306/042800710176. ^ Bialkowski, S.E. 2004. "Use of Acid Distributions in Solubility Problems". Archived from the original on 2009-02-28. ^ Zhang, D.; Zhang, Y; Zhu, A.; Cheng, X (2001). "Physical mechanisms of river waterfall tufa (travertine) formation". Journal of Sedimentary Research. 71 (1): 205–216. Bibcode:2001JSedR..71..205Z. doi:10.1306/061600710205. ^ Riding, R. (2000). "Microbial carbonates: the geological record of calcified bacterial-algal mats and biofilms". Sedimentology. 47: 179–214. doi:10.1046/j.1365-3091.2000.00003.x. ^ Pedley, M.; Rogerson, M.; Middleton, R. (2009). "Freshwater calcite precipitates from in vitro mesocosm flume experiments: a case for biomediation of tufas". Sedimentology. 56 (2): 511–527. Bibcode:2009Sedim..56..511P. doi:10.1111/j.1365-3091.2008.00983.x. ^ Forster, A.; Forster, S.C. (1996). "Troglodyte dwellings of the Loire Valley, France". Quarterly Journal of Engineering Geology and Hydrogeology. 29 (3): 193–197. doi:10.1144/GSL.QJEGH.1996.029.P3.01. ^ "Au Turonien". Une histoire de la Touraine à travers ses roches (in French). Retrieved 2010-10-01.